This is a show I'm in that opens Saturday, November 24. Many of these artists are not in what I'm calling the Steffany Martz Biennial (in joke--meaning the Whitney 2008). 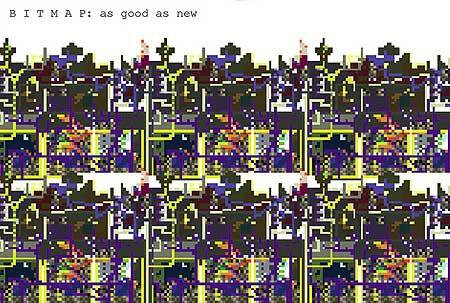 I'm pleased to be in "Bitmap," though--a kind of counter Biennial for the abject geek set. I started using the word "bitmap" in gallery labels about '98 to the consternation of print mag reviewers so it's nice to be in this crowd. VertexList space and Blip Festival have the pleasure to present “B I T M A P: as good as new” a group exhibition celebrating the history of the digital image, the aesthetics of early computing and early video-game consoles. Expect pixels, old monitors and 8 bit sounds! "B I T M A P: as good as new" is proud to feature: Cory Arcangel, Chris Ashley, Mike Beradino, Mauro Ceolin, Petra Cortright, Paul Davis, DELAWARE, Notendo (Jeff Donaldson), Eteam, Dragan Espenschied, Christine Gedeon, Kimberley Hart, Daniel Iglesia, JODI, Olia Lialina, LoVid, Kristin Lucas, David Mauro, Jillian Mcdonald, Tom Moody, Aron Namenwirth, Mark Napier, Nullsleep, Marisa Olson, Will Papenheimer, Prize Budget for Boys, jimpunk, Akiko Sakaizumi, Paul Slocum, Eddo Stern and CJ Yeh. A reception will take place at vertexList on Saturday, November 24th 2007 from 7pm - 10pm. The exhibition will be on display until Sunday, February 3rd, 2008. Live 8 BIT music performance @ the opening reception, 8.30pm.